Ingrown toenails are due to the penetration of the edges of the nail plate into the soft tissue of the toe. It begins with a painful irritation that often becomes infected. With bacterial invasion, the nail margin becomes red and swollen often demonstrating drainage or pus. In people who have diabetes or poor circulation, this relatively minor problem can be become quite severe. In this instance, a simple ingrown toenail can result in gangrene of the toe. Patients with joint replacements or pacemakers are at risk of bacterial spread through the bloodstream resulting in the spread of infection to these sites. These patients should seek medical attention at the earliest sign of an ingrown toenail. 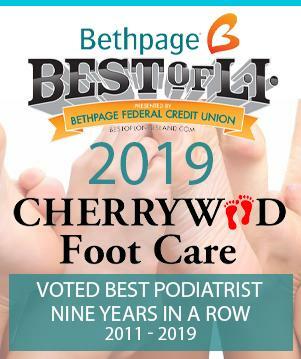 There are several causes of ingrown toenails: a hereditary tendency to form ingrown toenails, improperly cutting the toenails either too short or cutting into the side of the nail, and ill-fitting shoes can cause them. Children will often develop this painful condition as a result of peeling or tearing their toenails off instead of trimming them with a nail clipper. Once an ingrown toenail starts, it will often reoccur. Many people perform “bathroom” surgery to cut the nail margin out only to have it return months later as the nail grows out. Treatment for ingrown toenails is relatively painless. The injection to numb the toe may hurt some, but a skilled doctor has techniques to minimize this discomfort. 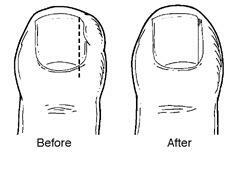 Once the toe is numb, the nail margin is removed and the nail root in this area is treated so the nail corner will never come back. The rest of the toenail is unchanged, only the offending corner. Most commonly, the doctor will use an acid to kill the root of the nail, but other techniques are also available. It may take a few weeks for the nail margin to completely heal, but there are generally no restrictions in activity, bathing, or wearing shoes. Once the numbness wears off, there may be some very mild discomfort but rarely does this require pain medicine. A resumption of sports activities and exercise is generally permitted the following day. There are very few complications associated with this procedure. Reoccurrence of the ingrown toenail can take place a small percentage of the time. Continuation of the infection is possible, which can be controlled easily with oral antibiotics.